Yugadi, When is Ugadi in 2013?, Ugadi 2013, Ugadi Date, Ugadi Festival 2013. 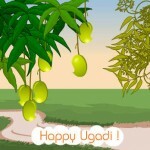 Ugadi as the name suggest is a start and it is the first day of the year. Ugadi is celebrated during Chaitra Sukla Paksha Padyami or First day of the waxing phase of the moon in the month of Chaitra as per Telugu calendar. 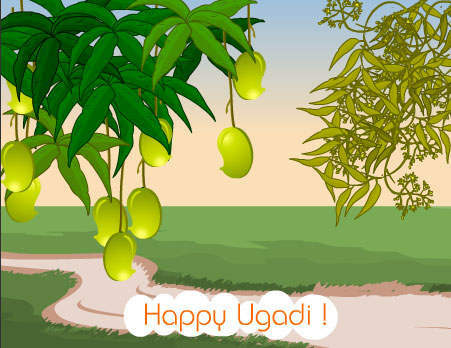 This year Ugadi will be celebrated on Thursday, 11th April, 2013 . Ugadi means the start of the Yuga (Yuga + Adi =Ugadi). The Telugu new year starts from Ugadi. Ugadi is one of the traditional festivals of Andhra Pradesh. Ugadi is celebrated with different names in different parts of the country like Gudi Padwa in Maharashtra, Thappan in Rajasthan, Cheti Chand in Sind etc. In Andhra Pradesh the ritual of Ugadi begins with getting up early in the morning and taking a head bath. After the bath it is a tradition to eat Ugadi Pacchadi or Ugadi Pickle before even drinking or eating anything. The Ugadi Pacchadi is prepared from neem flower, Jaggery, Green Chillies, Salt, Tamarind, pieces of unripe (Green) Mango. After eating the Ugadi pickle it is a custom to read the Panchang of the year and know what is in store for each according to the Rashi. New clothes are worn on this day and children seek blessing from elders so that their year is good. Ugadi is the major (new year) festival of Karnataka, please update your information. UGADI is the TELUGU NEW YEAR FESTIVAL…. UGADI VERY IMPORTENT FESTIVAL FOR ANDHRA.